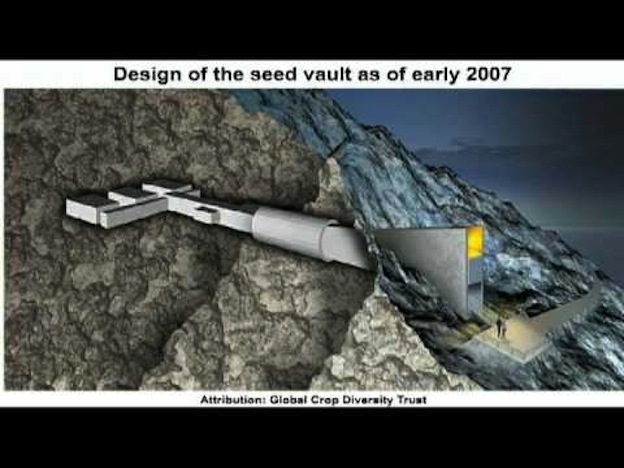 WHAT: A six-year-old, “doomsday seed vault” that could possibly keep treasured, rare and essential crop seeds, like barley, wheat, corn, beans and potato, viable for thousands of years. WHERE: in an abandoned coal mine, 1300 km from the North Pole, on a barren Norwegian island near the Arctic Ocean. WHY: for food security; protection against crop disasters; to secure biodiversity; to ensure agriculture’s future; to preserve seed species that may becoming extinct due to climate change or human interference. WHAT: a repository of just over a million frozen, duplicate samples of gene bank seeds from all over the world (about one-third of the world's food crop varieties) from countries such as Ireland, Canada, Switzerland, Syria, Columbia and Mexico. Each country owns its own stored seeds and can access them at any time. WHO: funded by the Norwegian government, the Rockefeller and Gates foundations and world-wide governments. BACK TO "DO YOU KNOW"